He either has a very special eye to these devices or is sitting atop a nuclear waste facility. Seems everything he touches runs by itself. Roman works for a company in Germany which specialize on R&D of free energy devices and it is not surprise when something outlandish come to akula and he just starts to build it... He's paid for that job. He's paid for that job. And a fine job it is. What is most interesting to me about Roman is that he is able to see something in these devices so easily that we struggle with. He knows exactly where to look and exactly what it is he is looking for, then makes some adjustments and bingo, it runs. You speak his language T. Have you ever heard him in his videos say something you thought was rather odd, but turns out to clearly be very important? So far everything he speaks about are going along lines of my research. The only one thing to me was new at some point was how he described operation of his Kapanadze style device where the strong resonant electric field from Tesla coil helped to NMR effect on his receiving coil which had strong magnetic field in alignment. For his Hendershot style video I do not see capacitors inside of cylindrical basket coils and this is main difference between original and his version. And on resonator coils with magnets he got capacitors. The rest of stuff for counter-balance is looking same so you do not need Earth grounding for its functioning..
Each coil is part of capacitor plate and the discharge is bouncing between two same coil-capacitors there. 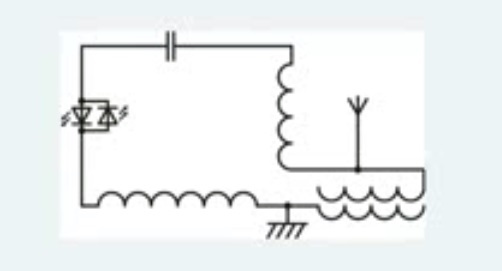 I'm still very curious about these open-ended coil schematics I see from these fellows. At some point I'm going to do some experiments with this type of configuration. The first one will be with coax cable--one side on each end open, the other conductor connected. I'll wrap the coax around a core and try some various waveforms induced into it and see what it looks like on the scope. From the conventional viewpoint, I don't expect to see any current developed, but it would be nice to be wrong, then I'll need some help explaining it. I wonder if you have thought about it anymore since that post back in 1997? I built a unit back in the mid 1980,s but never was able to get it operational. More recently I learned that Hendershot used beeswax to fix the large inner capacitor to the "basket weave" coils. This led me to think there might be some form of acoustic coupling between the two, with the capacitor acting as an electrostatic ultrasonic transducer. Although the serpentine coils have been later named basket weave, they don't bear much resemblance to actual basket weave coils of the early radio era where that type of construction was used to lower inter-winding capacitance. My guess is the Hendershot coils serve a different purpose acoustically, and may also explain the large capacitance values used in the device. I have not seen any of the replicators pursue this line of research, not even have I dusted off the old unit to test this idea, but I might! As far as thinking about it more, I didn't pay too much more attention to the Hendershot device after that, but went on the hunt for efficient, relatively low frequency, passive, nonreciprocal networks that maybe could be used in an OU device. I went more over to the Hall/Corbino side rather than the vibrating transducer side. I wonder just how easy it is to affect the C of an electrolytic capacitor? Taking one and measuring the C with or without a big fat magnet aligned with the axis would be a place to start. I'll have to look at the coil again, because there are some cross coil configs with interesting properties (E parallel B EM waves at right angles to the intersection)-- but that's pretty exotic. Hmm, it doesn't make any sense to me now that he would use the basket weave coil to reduce parasitic capacitance, because with that big mass of dielectric nearby there would still be plenty of C. So why use a basket weave? So I went and looked. De Forest, attached, shows the use of a Lecher line wrapped around a tube, as a highly Q transmission line stub. He discusses detecting both electromagnetic and electrostatic nodes on the wire, similar to the use of Lecher wire to measure wavelength. With the dielectric nearby in Hendershot, you have a distinct slow line structure. With two such slow lines, you might be able to create some large delay effect, that, for instance delays CEMF from the clapper until it becomes a positive force to drive the clapper? Would need a big mass of dielectric, and a coil with a large cross section (=high L). Pure speculation-- but resonance effects have been used in permanent magnet motors (which the clapper basically is) to apply CEMF to the next motor cycle. (patents by Goddard, Macdonald, Rupp, Subieta-Garron). In this case, the Hendershot machine becomes a permanent magnet motor where CEMF does not impede motor action but supports it. I note that the iron Cook Coils are long enough that there could be a substantial domain motion delay, with the secondary induction on one coil delayed enough to support the primary on the other coil (or something like that). Tesla also had transformers with a thin layer of metal between the windings to cause a delay, which could reach 90 degrees I think. The patent from 1925 by Willy shows serpentine coils used as retardation coils, and also right angle coils intended to reduce mutual L and C. It's the only patent in this class besides De Forest that seems relevant. Retardation coils seem to be often discussed in these patents as a way to make voices clearer in radio reception. It was a time of extreme levels of experimentation in radio, with all sorts of weird antennas, including underground ones (Rogers) and miscellaneous even stranger things. In fact, I recall a patent (but can't remember who did it right now) for a 'radiant energy detector' that had a clapper or something like it.